With Rasp Your Soul, Kat Válastur introduces the series “The Staggered Dances of Beauty” in which she reevaluates the production of mythology as a tool to process contemporary questions. 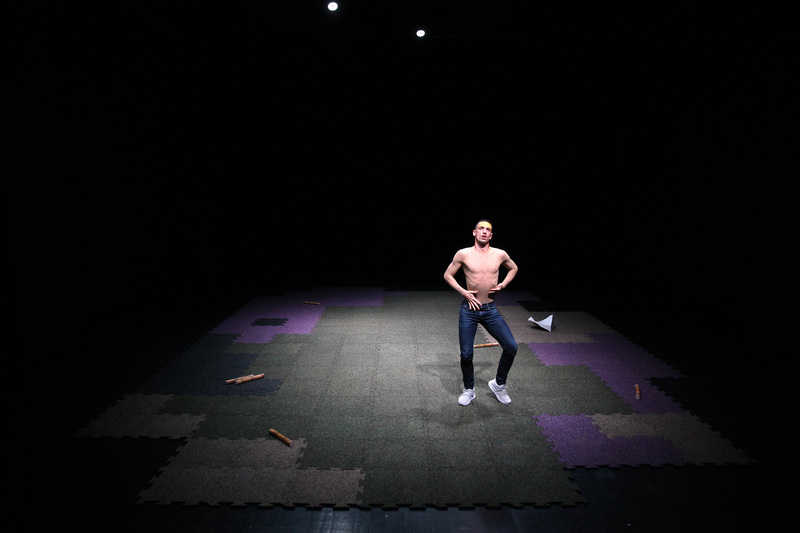 The performer in Rasp Your Soul enacts a some sort of a contemporary mythological being. Inside an uncanny environment he unleashes a series of kinetic monuments as altered codes of processed cultural signs. Ruins of language from capitalist digital culture transform into mantras that initiate precarious gestures, fading slang whispers, voice interruptions, molecular kinetics. We encounter elusive identities expressing different types of realness. The space becomes a field of tension between language and the visual connotations of fluid complex demands and input from the outside. Rasp Your Soul partly a dance piece, partly a choreographed concert, is a manifestation of the elusive. It builds up the narrative of a post-mythological space in which a humanoid with a “sensitive skin” makes us think about our flesh and bones. 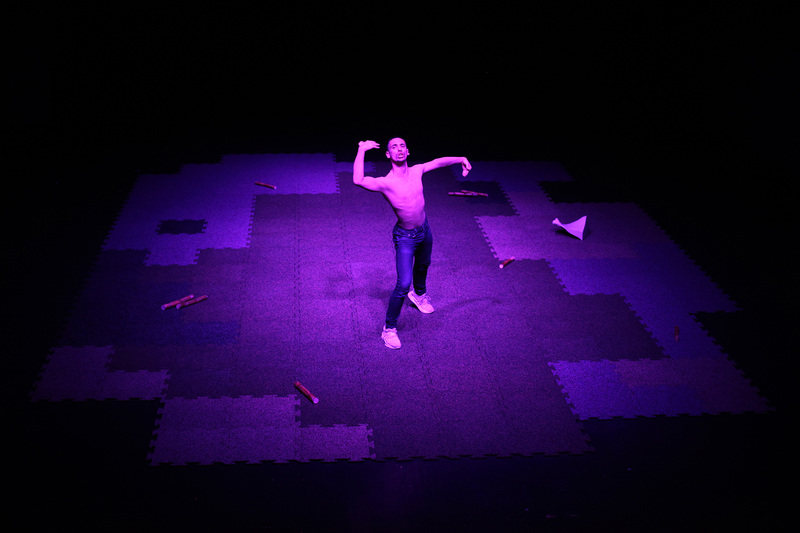 …The performer, with jeans and sports shoes and a t-shirt in the color of the skin reveals an expressivity that permeates us: exceptional flexibility, rich its range vocabulary, and a deeply engaged performing. It is a modern, mythological being that articulates our origins, enigmatic, without linear logic. Every cell of his body is involved in this passage from the “sensory” to the “psychic body”…Changes are steep, accompanied by intense and expressive vocalisations are overwhelming the viewer. The animal is always here and the mouth of the “pure humanoid” becomes a carrier of speech and anxiety. The kinaesthetic experience of the act makes us breath asthmatically as the lights go down and the face, the gestures and the sensitive skin of the humanoid who was breathing before like a tree are lost. …Her gaze, one would say, turns towards an anarchic exuberance of the senses, proposing a different delimitation of the dancing body on stage. If the body in the dance is usually a carrier of subjectivity that wants to express itself and to express through feelings or experiences through kinetic forms, in the case of Rasp your soul the body is divided, constantly oscillates in what recalls its animal origin and what verifies his human nature. However, the proposed scenic language skillfully manages to merge these two aspects without giving precedence to one or the other “nature”. The dancer is sometimes converted into a dummy, following impulses that lead him to a heavily charged body, and sometimes resembles a human cyborg, programmed to communicate through a verbal code that instead of transmitting meaning, returns to the basic principle of every language, the body. …On s’autorisera à y voir un précis de libre fantaisie, façon pop déjantée, mais quand même une texture sourde et profonde de fragilité méditative, de tentative flottante et horizons ouverts, testée au masculin. Une riche création sonore y fait écho, comme remontant par les pores de la ville, de ses médias, dans la tentation incertaine de produire un discours qui pourrait se tenir, mais n’y parvient pas à l’oreille. On sort tout balloté de cette traversée qui ne ressemble à aucune autre.